Wonderful Mid-Century, Complete Privacy And Stunning Views! Serenity and privacy abounds with panoramic, territorial views of the Santa Rosa mountains, Indian Head, Font's Point and the natural desert. The property is located on 15 acres of wild, pristine desert and the house sits far back off the road for total privacy. This lovely home is a spacious, renovated, mid-century modern ranch-style house. It features a large great room with a floor to ceiling stone fireplace and walls of windows with unobstructed views of the desert and mountains. This house has four bedrooms - on one end of the house there are two large bedrooms with queen beds and full private baths, on the other side of the house is a third bedroom with a queen bed and a full bath directly across the hall and a fourth bedroom with bunk beds (a double on the bottom and a single on top). In addition to the large, remodeled, sparkling white kitchen and comfortable great room,there is a separate TV room/study with wonderful desert views. The very large front patio is a perfect place to experience sunrises and sunsets and for spectacular star gazing. (Borrego Springs is only one of two designated Dark Sky communities in the U.S.). There are endless possibilities for visitors of the largest state park in the California (700,000 plus acres). Enjoy back country hiking and camping on over 500 miles of dirt roads and 110 miles of hiking trails. As the homeland of Native American peoples for thousands of years there are many historical and geological wonders to explore. Attend excellent state park naturalist talks and field trips, wildlife viewing and spring wildflowers. From this property you can bicycle for miles on quiet roads, walk out and explore the desert, drive to town for shopping and restaurants or simply watch the parade of Roadrunners go by from your deck chair. When you want to dine out, have a cocktail, get a massage, work out at a great gym or swim in a beautiful pool, the newly remodeled and reopened La Casa de Zorro is just a short walk from the property. A walled-in backyard provides security for your well behaved four legged companions. Come and bring your children, friends, pets and yourselves for a large gathering or an intimate vacation. Come and experience the wonders of the California desert. I bought this magnificent property for the serenity of the desert; for the overwhelmingly beautiful views; for the night sky and because I love mid-century architecture. Since the home is set on 15 acres, I know my privacy will always be protected. For now, I am choosing to rent my home but you can bet I will be there when it is available. I hope you love this special place as much as I do. We enjoy this place. It’s out of town, which is nice with the Super Bloom. The view over the valley is amazing. Very relaxing. We enjoyed our stay very much. Nice house with great views in a good location, very quiet and peaceful and close to many hikes. The house was clean and well equipped, and Robin was great about communication and everything we needed. Highly recommended! 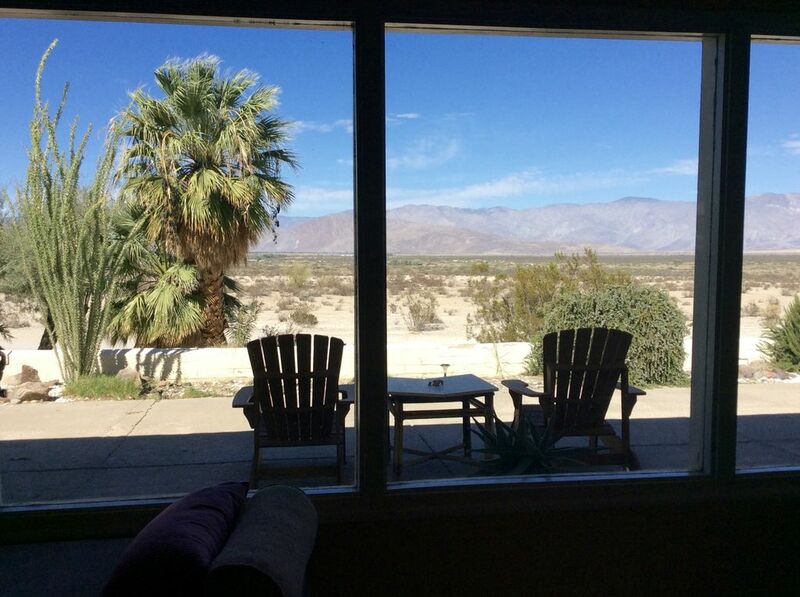 Beautiful views of the desert right from the livingroom. This home is lovingly curated and it shows from the ipod playlist to the dishes. My family of 4 thoroughly enjoyed a relaxing long weekend there. I could imagine there must have been a few fabulous parties here. We came on a full moon night so the landscape was lit up at night which was beautiful too. I hope to come back on a moonless night to truly enjoy the stars. We are a group of three couples who returned to this property because it works well for us. There are three bedrooms and three baths so we each have our own privacy and yet the public space is open and spacious. The front patio looking north to the desert and mountains is outstanding. The kitchen is well equipped. It is a surprise to arrive at the property because it is at the end of dirt driveway but this allows you to have a wonderful private setting. Great location and a good property manager. We are so glad we found this house. It was perfect for our extended family of two couples and two singles, with plenty of room to spread out and do our own things or sit together and chat. A binder chock-full of information about the house and the local area helped us to get oriented and plan our activities. A book collection helped to guide our hiking excursions and satisfy our curiosity about local geology. Hummingbirds came to dine on the flowering shrubs, and a coyote eyed us from a safe distance. Our group of young and old found plenty to do in the Borrego Springs area during our four days there: hikes for the vigorous, an off-road vehicle tour for the less vigorous, a day trip to the wildlife refuges and mud volcanos near the Salton Sea. The booking process was straightforward and the property manager responded quickly to questions.